The average price for this game in the past 6 months is $9.26. The game first became 50% off on Aug 3, 2015 at Steam Store. Lowest historic price was $2.99 on Mar 7, 2018 at Fanatical. The Middle-Earth: Shadow of Mordor Bundle discount to four bucks at Fanatical today. A $20 purchase on Steam and elsewhere online $8 or more. Great pick up at this price if you're interested in Shadow of War and still don't have Shadow of Mordor in your Steam library, this will fix things up nicely. Want to try Shadow of War but you still haven't bothered with Shadow of Mordor (hey we're out there), grab the GOTY for $6.40 at GMG this week as they celebrate the release of the latest Middle-earth title. Thoughin early July Bundle Stars had the Middle-Earth: Shadow of Mordor GOTY for $2.99, that was a 24-hour only sale. They have almost retuned to that price point in their Summer Sale, now offering the game for $3.59. Decent 82% off the usual $20. Middle-Earth: Shadow of Mordor Game of the Year Edition has dropped to $3.40 for the next few hours at GMG. Pennies off the all-time low and you get a free game as a bonus. Honestly at the sub-$4 price point Shadow of Mordor GOTY Edition should be an automatic purchase for a lot of PC gamers. If you somehow still don't have this title in your library, or you're new to PC gaming - then this is a must purchase. The average price for this game in the past 6 months is $6.50. The game first became 50% off on Nov 30, 2015 at Best Buy. Lowest historic price was $4 on Jul 6, 2017 at Microsoft. New low on Middle-Earth: Shadow of Mordor GOTY on Xbox One at Microsoft. Includes the Middle-Earth: Shadow of Mordor and all its numerous DLC packs. Just the base game alone sells for $9.89 on Amazon. New low on Middle-Earth: Shadow of Mordor Game of the Year Edition for the Xbox One and PS4 at GameStop. Cheapest ever by $5 and $20 off the usual $40. Funny enough, GameStop is charging $34.99 for pre-owned copies of Shadow of Mordor GOTY. The average price for this game since released is $16.07. The game first became 50% off on Nov 30, 2015 at Best Buy. Lowest historic price was $3.99 on Jun 28, 2017 at . We've seen some great Middle-Earth: Shadow of Mordor GOTY deals for PC during this Winter Sale, but here's a rare discount on the PS4 version of the game. GCU members can take another 20% off. PS4 version of Middle-Earth: Shadow of Mordor GOTY down to only $12 at Amazon. New low by $3. Digital code delivered by email, so no need to wait days on end for a snail mail delivery. If you're thinking about Shadow of Mordor, check out this in-depth review by Dealzon user Brian Walker here. The average price for this game since released is $31.21. The game first became 50% off on Nov 28, 2014 at Amazon. Lowest historic price was $3.99 on Jun 22, 2017 at Steam Store. Shadow of Mordor returns to historic low, tying its previous rock bottom price of $9 back in August (summer sale). If you still don't have the game, this is a good time to pick up the title. Sale ends soon. Middle-earth: Shadow of Mordor PC price hacked, slashed, and burned to $9 after coupon at FunStock Digital. Cheapest we've seen the PC Download version go for by about $2. 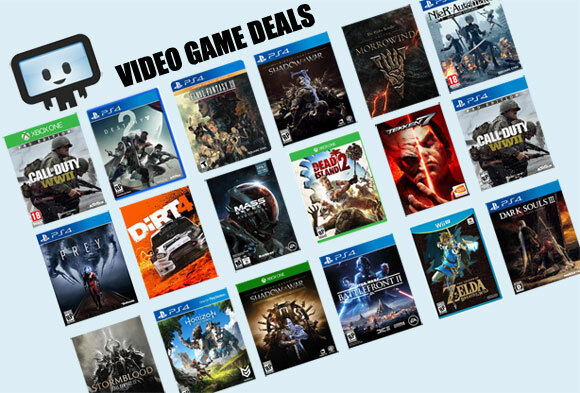 Middle-earth: Shadow of Mordor hits an all new low today at FunStock Digital after a massive instant savings + Stacking coupon code. At $10.54 it's cheapest ever by $3.49a nd 11 off a almost $40 off the $50 list price. One of the top games of 2014 hits historic low price of $14 courtesy of FunStock Digital. 8.99 GBP or about 12.60 Euro for those abroad. Steam key. Hot dang Middle-earth: Shadow of Mordor is cheap over at GamesPlanet. Even if you're in the US you'll need to go through checkout seeing a £10.99 British pounds price, but you'll be charged in USD which comes out to about $17.05. Lowest price ever. Exclusive ‘Guardians of the Flaming Eye’ Orc Warband mission: Face Sauron’s elite Defenders before the Black Gate and earn the Rising Flame rune. Early access to the ‘Trials of War’ challenge series: Test your skills against select legions of Sauron’s forces in challenge modes and compete against others on the leaderboard. Access to future content: Including runes, skins, + future add-on content. Lord of the Hunt – Hunt the wild beasts of Mordor as player’s discover hidden lairs, earn unique runes, and face off against powerful monsters. The Bright Lord – Play as Celebrimbor, the great Elven smith of the Second Age, and battle against Sauron and the might of his forces. The average price for this game since released is $19.60. Lowest historic price was $18.24 on Oct 21, 2014 at Green Man Gaming. New low on the Middle-earth: Shadow of Mordor Season Pass. Get all future planned DLCs at a 27% discount no coupon required. You know how it goes. Game hasn't even been released but you can order all the future planned DLCs for a "fraction" of the price. Such bargain. Much deals! Shadow of Mordor Season Pass comes with extra bonuses on launch as extra incentive + future story/content DLCs. Steam key. The average price for this game since released is $29.54. The game first became 50% off on Nov 27, 2014 at Walmart. Lowest historic price was $12.99 on Mar 15, 2016 at Woot. October 7th marks the release of more than just Dragon Age Inquisition, WB's Middle-earth: Shadow of Mordor will make its debut at the same time. The Xbox 360 and PS3 pre-orders are $10 off this week at Amazon. In addition, pre-ordering from Amazon gets you a unique "The Deadly Archer Rune" bonus. The average price for this game since released is $28.69. The game first became 50% off on Nov 23, 2014 at Kmart. Lowest historic price was $9.99 on Sep 15, 2015 at GameFly. Middle-earth: Shadow of Mordor for the Xbox One and PS4 slashed to $15 at GameFly. Lowest price ever seen by $5 for the 8th gen consoles. Shadow of Mordor on Xbox One dropped to $25 today at Target - tying the lowest price ever. Shipping isn't free but you can get them to ship to a local Target store and pickup for free. Looks like Amazon is price matching too. Bam. Only during Black Friday will console games rival PC games in prices (or out right beat them). Xbox One and PS4 Shadow of Mordor on sale at 58% off, only $25 at Kmart. Store pick up and online ordering only (weird mix). The average price for this game since released is $28.35. The game first became 50% off on Nov 23, 2014 at Kmart. Lowest historic price was $14.99 on Sep 15, 2015 at GameFly. Console gamer looking for a deal on Middle-earth: Shadow of Mordor? Today, Best Buy dropped the price on PS4 and Xbox One down to $15. Shipping is free if you have a total order of $35+ or free store pickup available. Shadow of Mordor hits lowest price on the PS4/3 and XBox One/360. List price is now $40 with a 50% off discount, making final price $20. Free ship if you reach the threshold, otherwise free in-store pick up. Solid price fora great game.